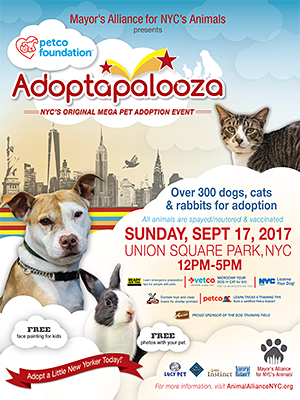 Join the Mayor's Alliance for NYC's Animals for Adoptapalooza, our signature pet adoption extravaganzas! 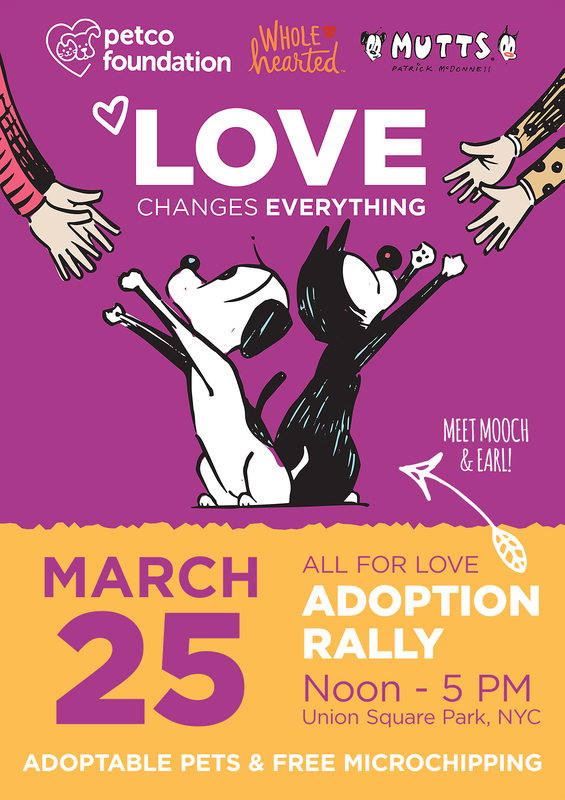 These public events feature wonderful cats, dogs, and sometimes rabbits for adoption from dozens of Alliance Participating Organizations. Each Adoptapalooza features additional activities, which might include advice on pet care, training, and grooming; product giveaways; microchipping; dog licensing; pet photographers; dog performances; or other fun activities for the whole family — two- and four-legged alike. 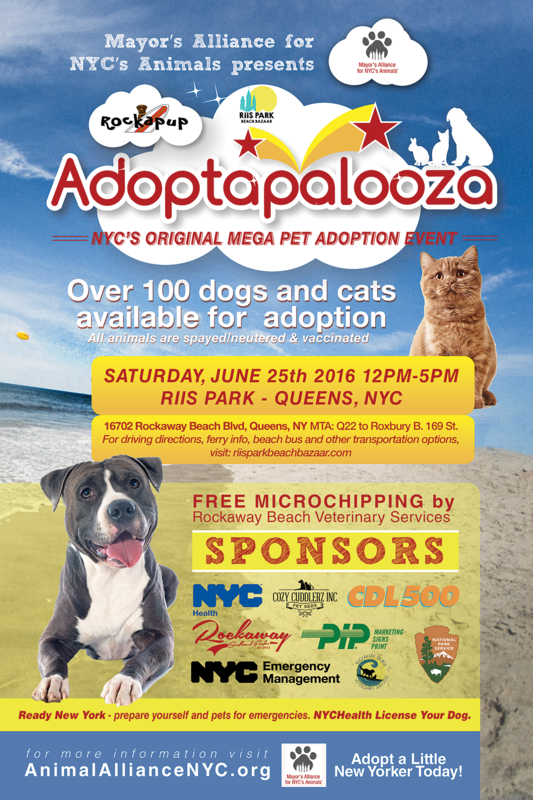 The Mayor's Alliance for NYC's Animals is proud to present Adoptapalooza in partnership with the Petco Foundation! More than 300 dogs, cats, puppies, kittens, and rabbits will be available for adoption from more than 30 New York City area shelters and rescue groups. Confirmed organizations include All About Spay Neuter, Animal Care Centers of NYC (ACC), Animal Haven, The Animal Project, Anjellicle Cats Rescue, ASPCA, Best Bullies, Bideawee, Bronx Tails Cat Rescue, Bully Project, City Critters, Inc., Cypress Feline Rescue, Frankie's Fund for Feline Care and Rescue, Grateful Greyhounds, GROWL, Hudson Valley Humane Society, Husky House, K9Kastle, KittyKind, Linda's Cat Assistance, Little Wanderers NYC, Long Island Bulldog Rescue, Louie's Legacy Animal Rescue, Muddy Paws Rescue, The Patricia H. Ladew Foundation, Place for Cats, Posh Pets Rescue, PupStarz Rescue, Rabbit Rescue & Rehab/NYC Metro Rabbit, Red Hook Dog Rescue, Rescuzilla, Second Chance Rescue, and Zani's Furry Friends. All animals for adoption have been vaccinated and spayed or neutered. Adoption fees vary by organization. Every adopter will receive a free Alex and Ani bangle bracelet featuring the Alliance paw print logo! Have your dog or cat microchipped by Vetco. The first 50 microchips will be FREE, or only $15 after the first 50. Learn emergency preparation tips for people with pets from representatives from New York City Emergency Management / Ready New York. and American Red Cross Greater New York Region. Take home free, personalized pet ID tags, courtesy of the Mayor's Alliance for NYC's Animals. Have Fun with Your Whole Family! Learn tricks and training tips from Petco certified trainers on the Merrick Dog Training Field. Bring your children to the Kids' Korner for face painting and temporary tattoos by The Cheeky Chipmunk, caricature portraits of people and pets by Lorelei Arts, and more. Have free photos taken with your pet by the Mayor's Alliance for NYC's Animals and Petco Foundation. Learn how you can use the Besto video app to find the perfect pet to adopt yourself or to help other shelter pets find their forever homes. Take Home Free Pet Products! Pick up free pet food samples, other products, and information from pet-related vendors. Confirmed vendors include Blue Buffalo, Lucy Pet Products, Merrick, Natural Balance, Nature's Variety, Petco, Solid Gold, Unleashed By Petco, and WholeHearted. Rock & Rawhide will collect your donations of clean towels, blankets, pet toys, and other supplies for shelter animals living in NYC and areas impacted by Hurricanes Harvey and Irma. Learn About Other NYC Animal Organizations! Talk to Certified TNR Caretakers from the NYC Feral Cat Initiative about Trap-Neuter-Return (TNR) and how you can help feral and stray community cats and reduce the number of kittens being born on the streets in your neighborhood. Learn how Pets for Vets is providing second chances for shelter pets by rescuing, training, and pairing them with military veterans who can benefit from a companion animal. Meet wildlife experts and rehabilitators and learn about the wild animals who share our urban home at the Wild Bird Fund and Wild Dog Foundation booths.